Aprende sugerencias y la manera más fácil de dominar tu LG G Pad™ 10.1 LTE. Inserting/Removing a SIM is helpful when receiving activation errors (SIM not detected/Not valid/failure/not recognized/misaligned), having trouble with the browser or have a blank/frozen screen on the LG G Pad 10.1. Here's how to add a user account to your LG G Pad LTE 7.0 / 10.1. El modo multiusuario te permite crear cuentas separadas para diferentes usuarios en tu LG G Pad™ 10.1 LTE. Mira los pasos a seguir para agregar y borrar cuentas de usuario. An interactive map of the buttons and Home screen of your LG G Pad 10.1 LTE. Conoce cómo encender y apagar tu LG G Pad 10.1 LTE. A soft reset can resolve issues like continuous resetting/rebooting (turning off and on), device crashing, freezing, device locking up, and keypad not responding. Mejora el rendimiento de la batería de tu LG G Pad™ 10.1 LTE. Here's info on the battery specs (e.g., Usage Time, Standby Time, etc.) for your LG G Pad 10.1 LTE. Here's how to improve the battery life for your LG G Pad LTE 7.0 / 10.1. Learn how to switch to Battery Saver mode to help conserve energy on your LG G Pad 10.1 LTE. Aprende a conectarte con otros dispositivos con Bluetooth® en tu LG G Pad™ 10.1 LTE. To make your LG G Pad LTE 7.0 / 10.1 visible to Bluetooth devices, view this. Conoce cómo conectar tu LG G Pad 10.1 LTE con tu dispositivo Bluetooth. Learn how to send photos to another Bluetooth device, like a tablet or printer, with your LG G Pad 10.1 LTE. Here's info on common camera settings (e.g., storage, timer, etc.) for your LG G Pad 10.1. Learn how to adjust the video setting for easy sharing in emails, social network posts and more on your LG G Pad 10.1 LTE. Conoce cómo tomar una foto de la pantalla y verla en tu LG G Pad 10.1 LTE. A visual guide for changing scene modes to take a picture with both cameras at the same time on your LG G Pad 10.1 LTE. Conoce cómo grabar un video usando tu LG G Pad 10.1 LTE. A visual guide to set a picture as the Home screen background on your LG G Pad 10.1 LTE. A visual guide for sharing photos by email, social networks and more using your LG G Pad 10.1 LTE. A visual guide to sharing a video with another person or device using your LG G Pad 10.1 LTE. Conoce cómo tomar una foto usando tu LG G Pad 10.1 LTE. Learn how to take a picture while recording a video on your LG G Pad 10.1 LTE. An interactive guide on how to take a selfie with your LG G Pad 10.1 LTE. Conoce cómo acercar y alejar para tomar fotos en tu LG G Pad 10.1 LTE. Conoce cómo acercar y alejar para grabar un video con tu LG G Pad 10.1 LTE. If you can't transfer media between your G Pad LTE 7.0/10.1 and PC, view this info. Learn how to add a new contact to your LG G Pad 10.1 LTE. Discover how to add or delete contacts from your Favorites list on your LG G Pad 10.1 LTE. Descubre cómo asignar una foto a un contacto en tu LG G Pad 10.1 LTE. Discover how to assign a ringtone to a contact on your LG G Pad 10.1 LTE. Learn how to create a group of contacts on your LG G Pad 10.1 LTE. Conoce cómo compartir información para uno de tus contactos con alguien más usando tu LG G Pad 10.1 LTE. To turn the mobile data for your LG G Pad LTE 7.0/10.1on or off, follow these steps. Here's how to restrict the amount of data an app uses on your LG G Pad. If your LG G Pad LTE 7.0/10.1 shows the incorrect date and/or time, view this info to correct it. Conoce dónde encontrar el número de tarjeta SIM y el del tablet para tu LG G Pad™ 10.1 LTE. Here's how to view signal strength on the LG G Pad LTE 7.0 / 10.1. Here's how to share your screen / media files with another screen (TV, game console, etc.) using your G Pad 7.0 / 10.1. If the display on your LG G Pad LTE 7.0/10.1 doesn't rotate, this shows how to fix it. If your G Pad LTE 7.0/10.1 crashes, resets or runs slow, or apps freeze or reset the device, view this. Learn how to access settings on your LG G Pad 10.1 LTE for actions such as changing alert sounds or turning off GPS services. A visual guide for saving battery life on your LG G Pad 10.1 LTE by adjusting the screen timeout. A visual guide for muting your LG G Pad 10.1 LTE. Una guía interactiva para configurar tu LG G Pad 10.1 LTE en modo Airplane. Removing then re-adding a Gmail account on your LG G Pad LTE 7.0 / 10.1 often fixes email issues. Learn how to set up your personal and work email. Here's how to add a work email account on your LG G Pad LTE 7.0 / 10.1. To update the personal email password/server settings for your G Pad LTE 7.0/10.1, view this info. To modify data usage options for the personal email account on your LG G Pad LTE 7.0/10.1, view this info. If you're not getting notifications for the personal email on your LG G Pad LTE 7.0/10.1, view this info. To enter or edit the personal email signature on your LG G Pad LTE 7.0/10.1, view this info. To adjust the personal email sync frequency settings on your LG G Pad LTE 7.0/10.1, view this info. Conoce cómo transferir un email en tu LG G Pad 10.1 LTE. Aprende cómo agregar un archivo adjunto, como un documento o una foto, a un email con tu LG G Pad 10.1 LTE. Una guía visual para responder un email en tu LG G Pad 10.1 LTE. Una guía visual paso a paso para enviar un email usando tu LG G Pad 10.1 LTE. Learn how to send an email to a group on your LG G Pad 10.1 LTE. Learn how to access your work email on your LG G Pad 10.1 LTE. Discover how to access your existing email account on your LG G Pad 10.1 LTE. Conoce cómo acceder a diferentes cuentas de email en tu LG G Pad 10.1 LTE. Here's how to update the work email settings for your LG G Pad LTE 7.0/10.1. Removing then re-adding a work email account on your LG G Pad LTE 7.0/10.1 often fixes email issues. Removing then re-adding an email account on your LG G Pad LTE 7.0/10.1 often fixes email issues. Here's how to add a Hone screen shortcut to your LG G Pad LTE 7.0 / 10.1. An interactive guide on how to add folders to the Home screen on your LG G Pad 10.1 LTE to help organize your apps. An interactive guide on how to place widgets and apps on the Home screen of your LG G Pad 10.1 LTE for quick access to them. A visual guide for adding and deleting Home screens on your LG G Pad 10.1 LTE. An interactive guide on how to rearrange and resize widgets and apps on the Home screen of your LG G Pad 10.1 LTE. Una guía interactiva sobre cómo eliminar widgets y aplicaciones de la pantalla de inicio de tu LG G Pad 10.1 LTE. To turn Mobile Hotspot on/off on your LG G Pad LTE 7.0/10.1 or if you can't connect to Wi-Fi, see this. 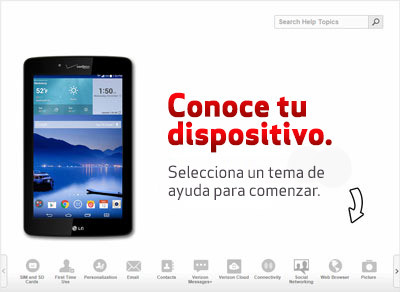 Mira cómo configurar el hotspot móvil en tu LG G Pad™ 10.1 LTE. To change the Mobile Hotspot password on your LG G Pad LTE 7.0/10.1, view this info. An interactive guide for setting up your LG G Pad 10.1 LTE as a Mobile Hotspot so you can share your data connection with other devices. Here's how to add a virtual private network (VPN) to your LG G Pad LTE 7.0 / 10.1. To remove a saved Wi-Fi network from your LG G Pad LTE 7.0/10.1, view this info. Navega por internet en tu LG G Pad™ 10.1 LTE. Learn how to bookmark a website on your LG G Pad 10.1 LTE so it's easy to find later. Discover how to find a website using your LG G Pad 10.1 LTE. Discover how to search the web using your voice with your LG G Pad 10.1 LTE. A visual walkthrough of opening, closing and switching between windows or tabs in the web browser of your LG G Pad 10.1 LTE. Una guía interactiva para cambiar las configuraciones de idiomas en tu LG G Pad 10.1 LTE. To disable the screen lock setting on your LG G Pad LTE 7.0 / 10.1, check out this info. Here's how to turn on and customize the Smart Lock setting on your LG G Pad LTE 7.0 / 10.1. To unlock the screen on your LG G Pad LTE 7.0/10.1, check out this info. Una guía visual sobre cómo configurar seguridad en la pantalla en tu LG G Pad 10.1 LTE para proteger tu información privada. Learn how to unlock the screen on your LG G Pad 10.1 LTE. Here's how to set up your facial recognition to unlock the screen on your LG G Pad LTE 7.0 / 10.1. View this info on memory card formatting options for your G Pad LTE 7.0/10.1. Discover how to insert a microSD card into your LG G Pad 10.1 LTE to add more memory for things like photos, videos, music and documents. Conoce cómo quitar una tarjeta microSD de tu LG G Pad 10.1 LTE. An interactive guide on how to easily find, open and close apps that are running on your LG G Pad 10.1 LTE. A visual guide for swiping between multiple Home screens on your LG G Pad 10.1 LTE. Discover how to access and clear the Notification Panel on your LG G Pad 10.1 LTE. If your G Pad LTE 7.0/10.1 has a blank or frozen screen or calling, app, audio and syncing issues, view this. To check for or to install software updates on your LG G Pad LTE 7.0/10.1, view this. To view the software version your LG G Pad LTE 7.0/10.1 is running, check out this info. Descubre cómo insertar una tarjeta micro SIM en tu LG G Pad 10.1 LTE. Conoce cómo quitar una tarjeta micro SIM de tu LG G Pad 10.1 LTE. Discover how to access your Facebook account on your LG G Pad 10.1 LTE. Learn how to log out of Facebook on your LG G Pad 10.1 LTE to help protect your account. A visual walkthrough on how to update your Facebook status and post photos using your LG G Pad 10.1 LTE. Si no estás recibiendo notificaciones o tu equipo no vibra/emite sonidos al recibir mensajes de texto/email, es posible que tengas que ajustar los controles de volumen. When you aren't getting notifications or your device doesn't vibrate / make sounds when receiving texts/emails, you might need to adjust the accessibility settings. Learn how to record a text message from your LG G Pad 10.1 LTE. Discover how to send a text message to a group of your contacts from your LG G Pad 10.1 LTE. Aprende a usar Q Pair para recibir notificaciones de llamadas y mensajes de tu teléfono en tu LG G Pad™ 10.1 LTE. Toma una foto y escribe en ella con la aplicación Quick Memo + en tu LG G Pad™ 10.1 LTE. Envía archivos multimedia desde tu tablet a otros dispositivos con Smart Share en tu LG G Pad™ 10.1 LTE. Discover how to find more help with using your LG G Pad 10.1 LTE through videos and tutorials. Descubre cómo cambiar el fondo de la pantalla de inicio de tu LG G Pad 10.1 LTE. To allow your LG G Pad LTE 7.0/10.1 to auto switch between Wi-Fi and mobile data, view this. Here's how to use Wi-Fi Direct so you can easily connect your G Pad LTE 7.0 / 10.1 with other Wi-Fi capable devices. Aprende a configurar Wi-Fi en tu LG G Pad™ 10.1 LTE. View this info if the Wi-Fi network you want to add to your G Pad LTE 7.0/10.1 doesn't display. Usa Wi-Fi Direct para conectarte fácilmente a través de Wi-Fi a otros dispositivos en tu LG G Pad™ 10.1 LTE. Learn how to use your LG G Pad 10.1 LTE to connect to a Wi-Fi network so you can access the Internet without using data.